As you approach through a beautiful courtyard oasis, you know you have arrived somewhere special. The comfortable outdoor furniture and olive trees are just the beginning of your experience at Aqua Décor and Design. Venture inside the store and you will be amazed. “The variety of items is endless,” says one customer. “I came in for a special gift and found quite a few special gifts for me,” she laughs. As you look around the store, furniture, jewelry, art, upholstery, lighting, bedding, and a vast selection of accessories—all arranged in ways that are truly unique—can be seen from every angle. Buyer and designer Liz Taylor has brought her incredible talents to life inside these walls. “Our showroom is evolutionary—always changing, always something new,” says Taylor, who has been an interior designer for over twenty years. If you don’t see something on the main floor, feel free to wander into the neatly organized warehouse. The variety of pieces at Aqua lets shoppers check out numerous items at one location. Designers in the area often send their clients to Aqua to see and feel items firsthand rather than relying on website images as a means of conveying a concept. “This store wasn’t even in the original plan,” Fisher says. Shawna and her husband, Vince Fisher, already owned Aqua Pool and Patio, a chain of stores along the Gulf Coast. Liz was hired to develop an outdoor furniture showroom. They soon decided to add a few lines of gifts and accessories to the pool and patio stores. Once they saw how well things were received, the idea of Aqua Décor and Design came to life. “We wanted to provide beautiful things at affordable prices,” says Fisher. It’s all part of Aqua’s motto: “Live beautifully indoors and out.” This goes for the interior design side of the business as well. Live beautifully indoors and out. 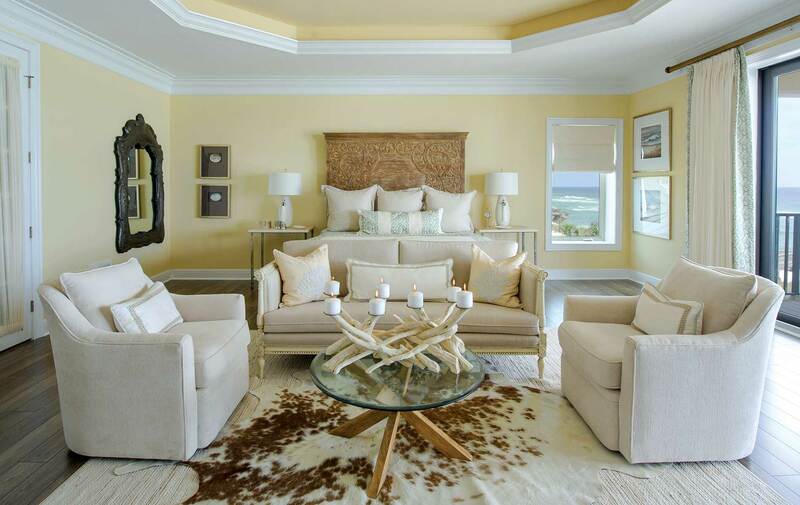 A Texas man who owned a Gulf-front vacation home in Navarre, Florida, wanted to surprise his wife by having it redecorated without her knowledge, and he wanted Aqua Décor and Design to do it. Doughty thought the surprise aspect was sweet, but she really wanted the wife’s input. She expressed this to the man; he agreed and told his wife, who was thrilled. After visiting with the owners, Doughty knew that not only should the space be beautiful, but it should be durable as well. Because the couple liked to entertain friends but also wanted a stress-free home, Doughty found furniture made for durability as well as style—a galvanized table, for example, and chairs with Sunbrella covers, making them easy to clean. Touches of Texas, such as cow horns and hides, were included in the home, which overlooks the blue-green Gulf of Mexico and beautiful white beaches. The master bedroom, the couple’s private retreat, received a more elegant look. To change the dated look of the custom cabinets, Doughty turned to Big Finish, a Pensacola firm, to provide a faux finish for a driftwood look. “Those rooms would not have had the same impact if the cabinets hadn’t been redone,” says Doughty, whose clients were surprised and delighted with the home’s new look—all done in the wife’s favorite colors. To complete the dream project, Design Star Fabrics provided custom window treatments, chair coverings, and custom bedding chosen by Doughty. Another plus is that the project was done in less than three months. The quick turnaround was possible because Aqua Décor and Design has thousands of items in its 11,000-square-foot building. This is a big advantage over many other designers who must special order items. Doughty gives credit to her coworker and fellow designer, Liz Taylor, who oversees the inventory and is always on the search for eye-catching items. “To be able to pull from your own inventory is wonderful,” Doughty says. “You can put as many beautiful things in a room as you want, but it’s the continuity and consistency that will give you the complete look you’re really after.” A look that will help clients live beautifully, inside and out.